Tanesha Sutton (left) of the University of Maine is guarded by New Hampshire's Ivy Gogolin (4) during the America East women's basketball game at the Cross Insurance Center in Bangor on Jan. 2. Game notes: The Great Danes have undergone an overhaul. Colleen Mullen is the new coach, and they lost their top three scorers from last season in Jessica Fequiere (17.3 ppg), former Lake Region of Naples star Tiana-Jo Carter (10.9 ppg) and Mackenzie Trpcic (9.1 ppg). Fequiere and Carter, who have graduated, were also the Great Danes’ leading rebounders. Trpcic averaged 6.5 assists per game, which ranked 14th in the country. Trpcic transferred to the University of California Davis. The Black Bears are 32-3 in their past 35 America East games at the Cross Insurance Center. 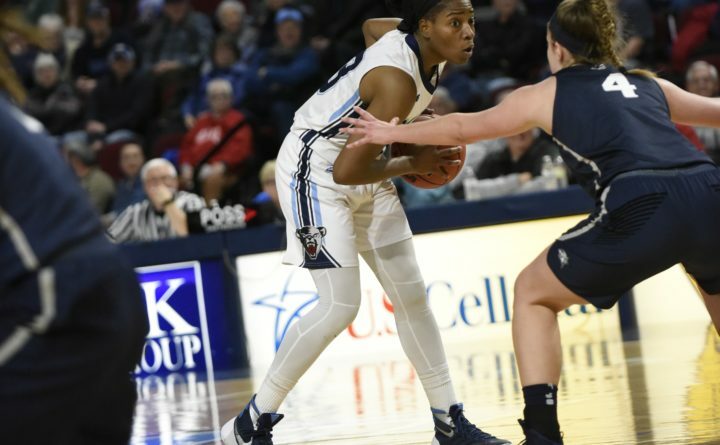 A win over UAlbany would give UMaine a 4-0 conference record that would represent the Black Bears’ best conference start since 2004.